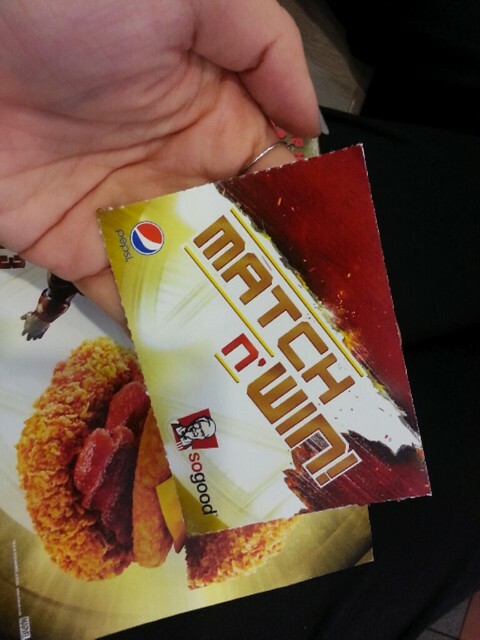 Chicken lovers, put your hands up! The new Zinger Double Down Max Burger is going to rock your (and my) world!! I attended the media tasting of this larger-than-life burger and I am so blown away by how addictive it tasted! My favourite part about this burger is that there is NO BUN! just so I don’t have to force myself to eat the buns if I am already too full by the time I get to the buns. I make sure the two chicken fillets are the first I get into my tum tum! 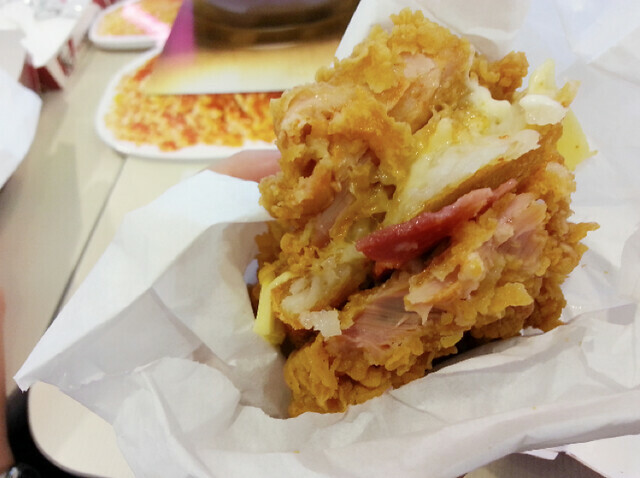 There was actually a similar burger in 2012, called the Zinger Double Down. 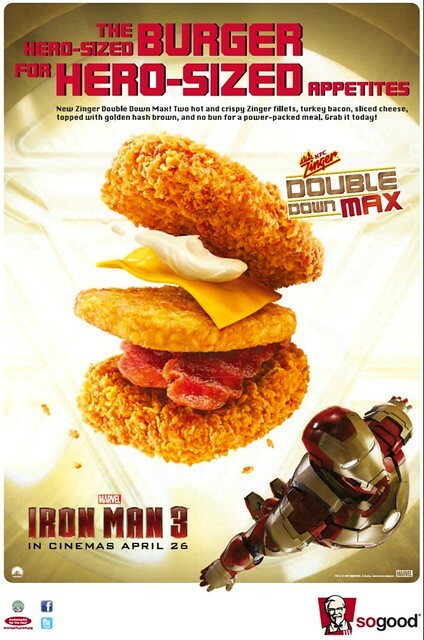 But this one takes it up another level because it has gotten bigger with an additional hash brown in the burger! IT WAS SO FREAKING JUICY AND GOOD! and I think it has the ability to even make Iron Man look puny in their poster. Hahaha! I ordered the burger without a full meal and I was already SO full when I finished the burger. So if you are a big eater, then this one will definitely be very fulfilling for you! 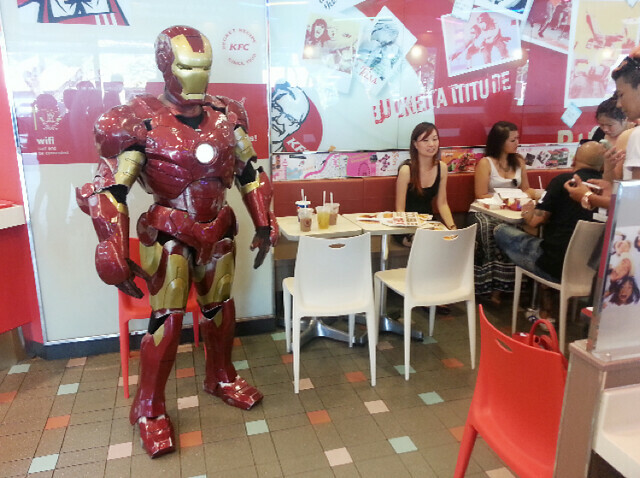 Superheroes need to eat their meals also ok? I always thought Robert Downey Junior was taller though. Hehe! there is also a chance for you to win up to $30,000 worth of prizes! Up tp $30,000 ok! 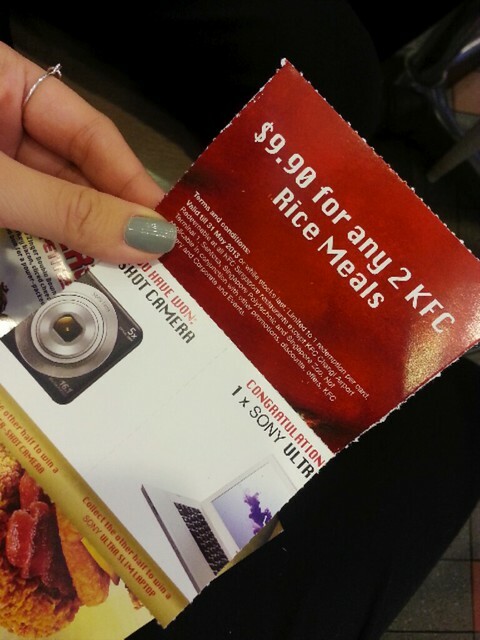 and you will receive 2 cards when you order these meal via http://www.kfcdelivery.com.sg! I assume you will already be able to guess by now what you need to do to win ya? Can we set up a forum and start trading our cards please? Hahaha. Sorry if you are on a diet, but diets can wait! But no-bun burgers that look this good are hard to come by! I hope they will have this on their permanent menu. An a la carte burger is going at only $5.90 and you can have it in a meal at only $7.50! Time to go online and order your burgers now! WEE! 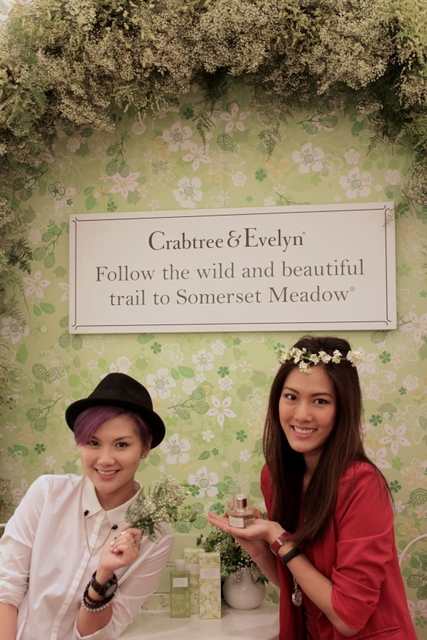 I also attended the launch of Crabtree & Evelyn’s Somerset Meadow range at Vivocity. 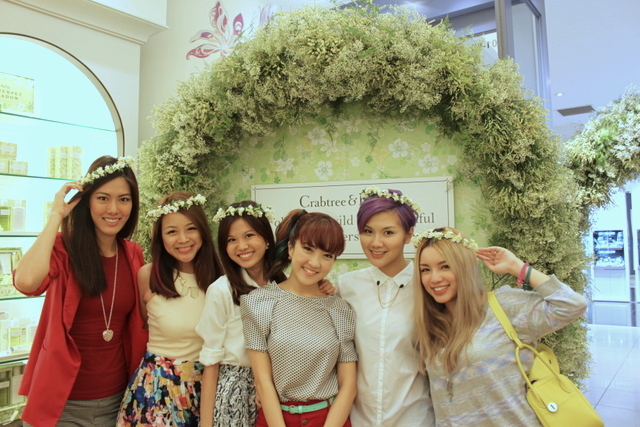 This is a freaking chio photo I have here thanks to photoshop! 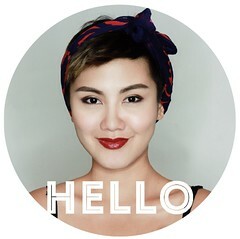 No more eyebags and I gave myself virtual botox. The shoes are just absolutely amazing! I thought it would hurt my feet when I first set eyes on it, but they are SO comfortable to be in. 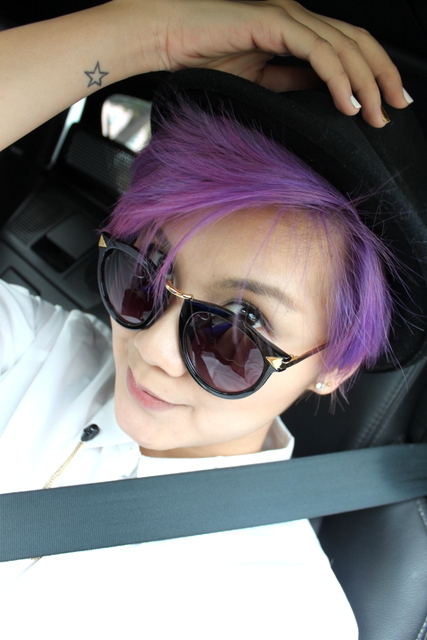 Love the shades from www.thequietriot.sg though. Heh. Here are some of the products from the new range. 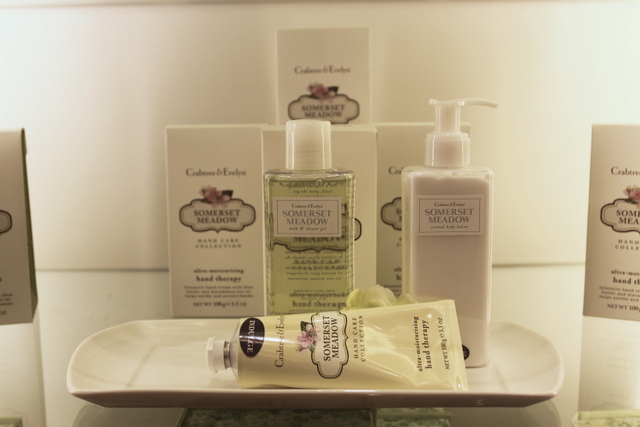 The scent just sets me in the spring mood right away – florals that are refreshing and not overpowering. Saw new bloggers and also the usual suspects (aka “colleagues). Haha! 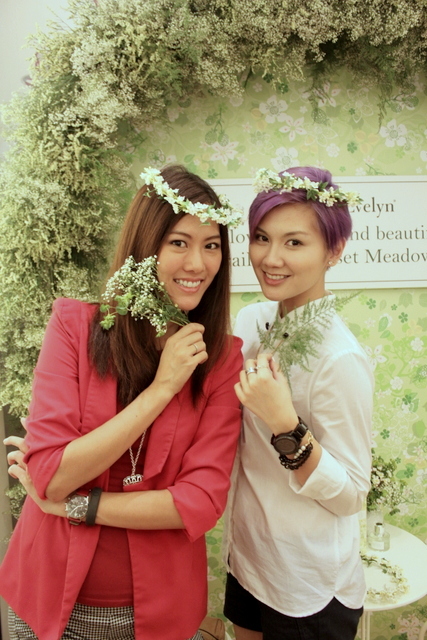 We were given these pretty floral crowns and I think I just totally failed the “romantic floral girl” look. Out of so many props, I chose leaves lor. So clever. Hahahaha! OK. Abrupt end to this post. Haha! Have an awesome Thursday peeps! loving the purple hair on you! very very nice! loving the infinity ring too!! the one on your left index finger. where can i get something like that?? pearly – Thank you for your compliment! The purple fades quite quickly though heh. The infinity ring is from Diva! Cheap cheap! Go get!